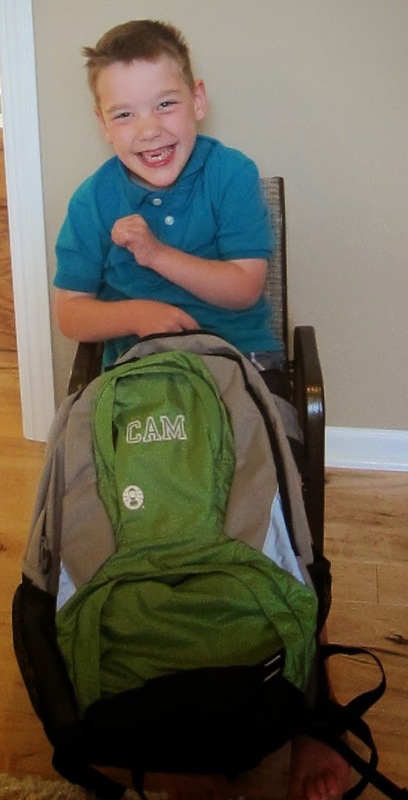 Hard to believe Cam is starting his first grade year at Meadow Brook! It was a week filled with meeting a new teacher, reconnecting with old friends and making new ones. Of course, our first grader couldn't wait to get back on the bus and bring his new personalized backpack and lunch bag. After a short, but tiring week, Cameron was invited to meet buddy Will and other friends at the Hudsonville Lanes to celebrate Will's 6th birthday! Yet another new experience for Cam embarking on his first bowling adventure. Will's mom, 'Auntie' Jo gave all of the kids bowling socks to take home. Bowling alleys have come a long way since Chris & Jane were young...the scoreboard provides the bowlers with a choice of backgrounds complete with animation and cheering. The "bumpers" are raised automatically on a lane with kids playing and there's even a handy ramp to push the bowling ball from for kids who need a little assistance. Cam was very intent and determined each time it was his turn. The evening warranted a big "high five" after eating pizza, bowling, and enjoying ice cream! Many thanks to Auntie Jo and Will for such a great idea and the exciting time! Saturday marked the first day of the fall opener for the WMML- West Michigan Miracle League. Cam was back on the field, this season on the Pirates team. He was one happy kid with a big cheering section starring Oma, cousins Coco and Libby, and our buddies/neighbors Steve, Patti, Megan and Emma. We're thankful for the opportunities our community provides and the awesome support we always have from our family and friends!